From the impressive Lizard Lighthouse, Tennyson’s “Southern Eyes of Britain” you soon come across the huge conical hole in the cliff top know as Lions den created when a sea cave collapsed in 1847. Climbing Bass Point covered in the South African Hottentot Fig you reach the Lloyds Signal Station which had in its heyday 1000 ships a month passing by to collect and deliver semaphore messages and register their route onwards. The Old Coastguard lookout here is still manned and as you head into the more remote sections of the Cornwall Coast Path you will be logged in as you pass. Serpentine Steps, a Shist Rock seat and Marconi’s experimental wireless station now restored by the National Trust are all passed before descending to Church Cove and its crumbling buildings from the Pilchard Fishing industry in days long gone. Beyond this admire Hugga Dridgee or the Devils Frying pan, so called due to its boiling waters, a stunning natural arch bridge over the mouth of an inlet. 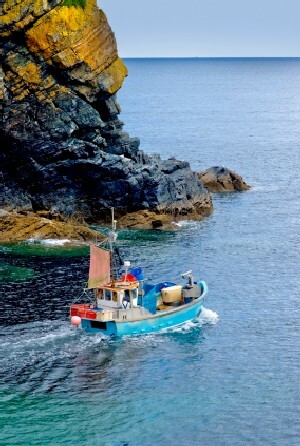 Welcome refreshments are found at Cadgwith a timeless Cornish Village where the fisherman still winch boats onto the cove to land lobster and crabs amongst thatched white washed stone cottages. In the afternoon pass through Kennack Sands a popular bathing spot with its rock pools full of sea cucumbers, starfish and other surprises. 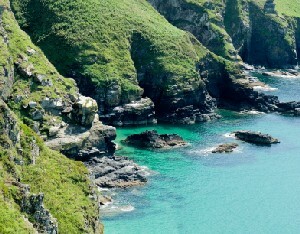 From Beagles Point you enter one of the most remote sections of the lizard. Its here notorious Pirate Captain John Avery is reported to have buried the fabulous treasures he took from the Great Mogul of India’s ships.